Iron has been used since shortly after 2000 BC to make everything from tools and weapons to cookware. They discovered that iron was stronger than bronze when mixed with a bit of carbon. The iron ore is heated in a charcoal fire, releasing the oxygen. This in turn mixes with carbon monoxide to form carbon dioxide. This allows a spongy, porous mass of relatively pure iron to form; mixed with charcoal, and other extraneous matter known as slag. Then they use crushed seashells or limestone to separate the slag out. At this point, the blacksmith would hammer out the slag and other small particles using a hammer on an anvil. This made wrought iron. Wrought means "worked". At very high temperatures, such as with a forge, the iron begins to absorb carbon rapidly, and the iron starts to melt since the higher carbon content lowers the melting point of iron. The result is cast iron, which contains 3 to 4.5 percent carbon. It is harder and more brittle, making it likely to shatter under heavy blows. This means it can not be shaped at the anvil. It is poured either directly into molds or into 'pig iron' bars, to be remelted later and poured. This is how your cast iron cookware is made. Other things are made with cast iron also. 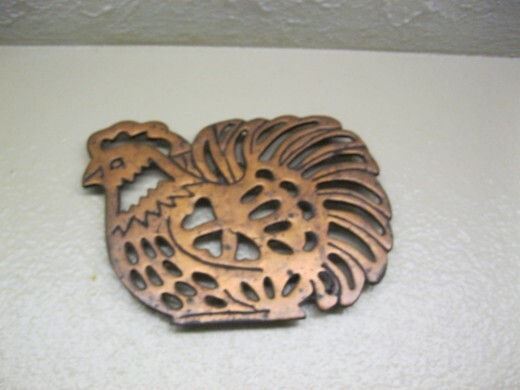 Trivets were made from cast iron to keep pots and dutch oven cookware from burning the wood tables. Spoons, ladles, and other cooking and serving utensils were also made from cast iron. Baking pans were made, allowing a cook to use a wood burning oven to cook with. The temperature to melt the cast iron is so high that you would not likely get your cooking fire anywhere near that hot. In the mid to late 19th century, cast iron was even used in architecture. It was very popular in New York City for entire facades of buildings. These buildings are endangered and a group in New York is attempting to save them. Caring for your cast iron is not difficult. If you are a cast iron user, you know that if properly seasoned, or cured, it is the first non-stick cookware.This is because a properly cured cast iron pan has grease in the pores of the iron which keep things from sticking. When you heat cast iron, the pores of it open, causing the grease to absorb into the iron. To cure your cast iron, clean it first. A simple wash in hot water will do. You then want to heat it on a flat baking sheet covered with foil. Heat it for 20 minutes to get it hot. Take it out of the oven and grease the pan with shortening or lard, not oil. Then place it on your cookie sheet, right side up. This way the grease will not drip down into your oven making a mess. Heat it at 350 degrees for 20 minutes. If it smokes, reduce the heat in 15 degree increments until it quits smoking. Give it a little longer if you had to turn the heat down. Let it cool, wipe it with a paper towel, inside and out, put it back on the cookie sheet for a second heating. Upside down this time. Another 20 minutes at 350 degrees and your pan is cured. Using it will add to the non-stick qualities. Some have suggested that you can use your gas barbecue grill to season it also and that keeps the smoke out of your home. Great idea and I don't know why I never thought of it. This method would work very well. This does not mean that it will never stick again. This means that from now on, you will be building on your start. The cooking that you do should start building a deep layer of grease in the pan and make it very good at not sticking. There are two schools of thought on cleaning your cast iron. One is that you just wipe it out and never let it touch water. Soap is a no-no because it will break down your non-stick grease. The other is that you just use a mild soap in your water and wipe it out. I prefer this method as it cuts down on the chance of cross contamination and gets the flavors of the other foods out of the pan. You would not want your fried chicken to taste like the fish you had the night before. When you finish this method, wipe it down with a paper towel. Then place it on the stove burner on low heat for a few minutes to force any water out. When you get done with this, lightly grease it with oil and put it away. If you miss some water and your cast iron develops some light rust, use steel wool to scrub it off and then grease and season the pan. If it is not light rust and does not come out with steel wool, use the method below for burning it off. Do not use sandpaper or a steel brush, these can cause grooves and scratches which will hold food particles; making the pan no longer non-stick. Some people wash them with salt or baking soda. These will also get the flavors of other foods out of them and will help get some crusted in foods out of them. Do not ever put your cast iron in the dishwasher. It is a hand wash item. Occasionally, you will goof and burn something into your pan. If it does not come right out, do not put water in it and let it soak. Cast iron does not like that water and will rust. Do not scrape with sharp instruments. That will scratch it and make it stick from then on and food will get in the scrape. Scrub it with steel wool. Not a soaped steel wool pad. If it still does not come out, do not throw it away and do not despair. A trick that I learned from my dad and grandfather is a life saver. It saves a lot of work and money, replacing cast iron is not cheap. Replacing good cast iron is just flat expensive. They would build a campfire in the back yard in their fire pit. Then they would lay the cast iron right at the edge of the fire and it would burn the food and grease out of the pan. Sit and enjoy your campfire because the food needs time to burn out. When the fire finally burns down, do not take the pan out until it is cool. The next day is soon enough. Then, LIGHTLY tap it with a hammer. The nasty burned in food will drop right out of the pan. You will have to start over seasoning or curing it but you have saved an expensive pan. I once sold a dutch oven for $150 so they are expensive. They go a lot higher too. Do you have some cast iron that you use? No, I have never used any and do not think I want to try it. No, but I would like to try using some. Yes, but I do not care for it. When you cook with your cast iron, remember not to use it for boiling water. Cast iron will rust. If it does rust, sand the rust with steel wool and re-season it. Do not store food in your cast iron. The acids in the food will attack the surface of it and cause pitting. High acid foods should be gotten out and the pan cleaned immediately. Use the lid and the even heating of this thick iron will amaze you. The lid keeps the flavors and vitamins in your food. This is also a good cookware to use if you have a low iron count. How else do you think all those people used to get their iron before vitamins. Some of the iron will get into your food and make it even healthier. When shopping for used cast iron, look for a smooth inner surface. If it is pitted, the food will stick. This is a sign of abuse or low quality. If you find an old piece at a flea market, that is rusty, dirty looking and real cheap, try the burn method. It will get all of that nasty off of it and then sand with steel wool. It will be ready to season before you know it. It really is amazing how wonderfully useful cast iron is. I love cooking with it. I would prefer to use it as it is such a joy to cook on. People buy new pots and pans every couple of years and do not think anything of it. When you buy cast iron, you will never have to replace it. I still have my grandmothers and it is just like new. 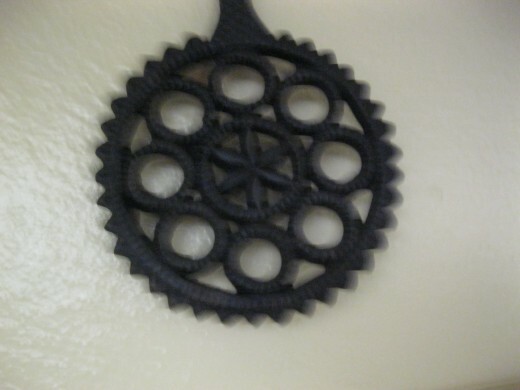 I have a collection of cast iron trivets that I have been collecting for years. I hang them on the wall in the kitchen and when I need one, I just pull it down. They are decorative, useful and handy all at once. Please remember to vote. I really appreciate the comments that I get on my hubs. They help me see if I am writing useful, interesting, informative hubs. If you would like to use information on these, please ask and please attribute. This is copyrighted work. I love cast iron and would use mine more often, except it hurts my carpel tunnel to lift it. I also enjoy the decorative element to what I have of it. I have several trivets that I use and they are very pretty. Thank you for coming by to visit. Cast-iron handme downs at least have value and practical use, especially relative to special occasion plates. prasetio, It is always a pleasure to see you and your wonderful comments. I truly appreciate the visit from you. Marie Flint, one of the benefits of cast iron is how it infuses your food with a bit more iron. Congratulations on the upcoming baby. They are always a joy. So nice of you to come visit. Very informative hub and I love your tips. Thanks for sharing with us. Vote up and keep up good work! Hi Phyllis, Good to see you here. I love cast iron and use it as decorations, since my carpel tunnel makes it painful to use it. I have a bunch hanging on the walls of my kitchen. My dad and grandfather taught me how to take care of it. 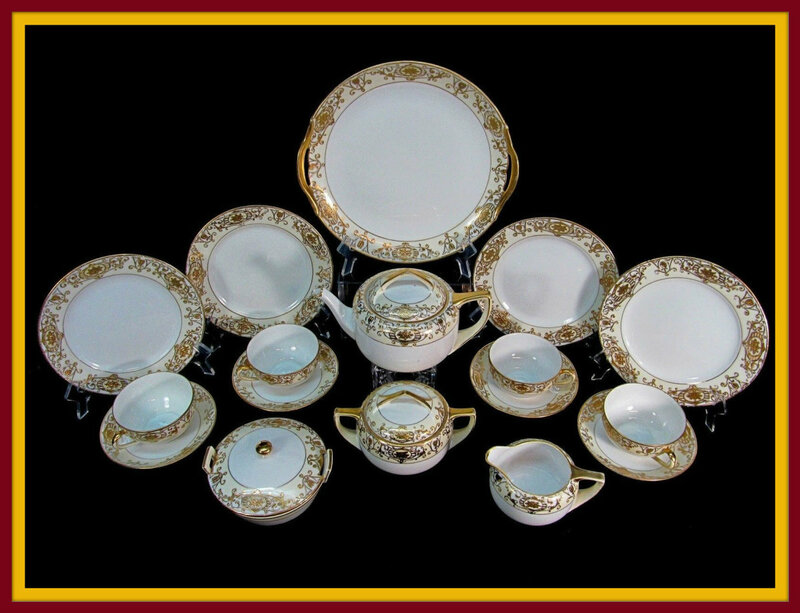 I find pieces at flea markets and yard sales, clean it,season it and sell it for a bit more. People are always happy to get an old piece that is in usable condition. I have gotten some that was rusty and filthy, and made it good and usable. Thank you for coming by to visit. Hi Don, good to see you out and about. Hope you are feeling better. My parents and grandparents all used cast iron. I have a friend that makes decorative cast iron objects. He sells them for a lot of money too. I am saving up for it. Thanks for coming by to visit. Hi Becky. I am so glad I saw this hub, thanks to dahoglund. This is a great, informational and very useful hub. My cast iron skillet belonged to my Dad and is almost 100 years old -- it is still like new and my favorite cooking utensil. Thanks for sharing your advice and writing this hub. I was very happy to see that all your advice is the way I take care of my skillet, as my Dad taught me. Voted Up, UAI, and shared. Hi Becky. This is very informative about cast iron. As I recall, my mother used some of it. I had a friend when I was working that worked with iron-his hobby and hopeful retirement was blacksmithing. Unfortuately he did not live to do that. The stuff he did do seemed to be in much demand. I'll try to remember the information you supplied here as the subject might come up in a story. rated up and shared. suzette, If you buy it pre-seasoned, you may never need to season it. Some of the older ones need to be seasoned a little more often. It should all be hand washed although many restaurants have to run theirs through the dishwasher to sanitize them. They use a lot more grease than I do though. Glad you found something helpful in here. Thank you for coming by to visit. Becky, what a fascinating article. 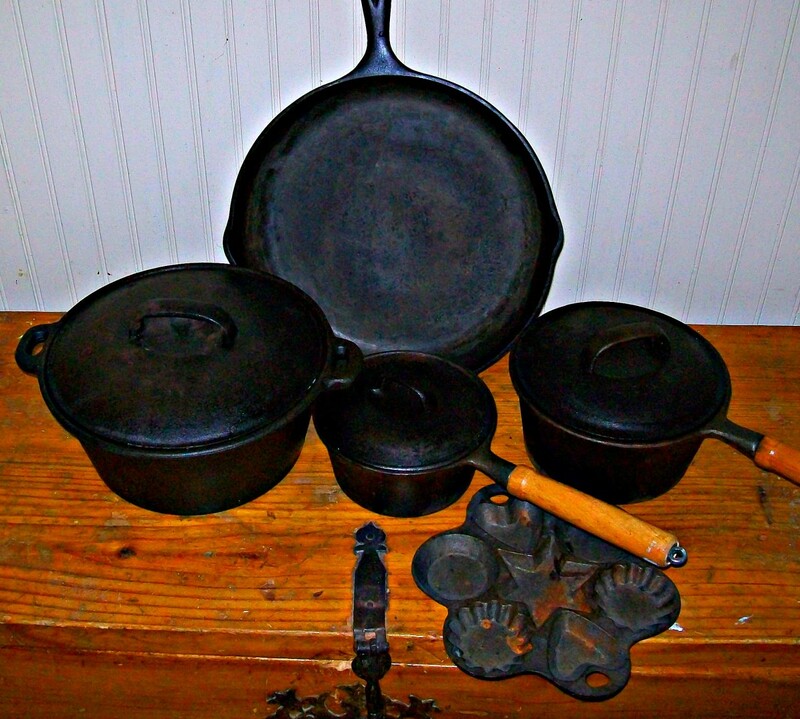 I have some cast iron cookware and it is a hand washed item at my house. I didn't know how to season cast iron and to tell you the truth I never have. So reading this is really helpful to me. This is a wonderful article. Thanks for sharing you knowledge with us. 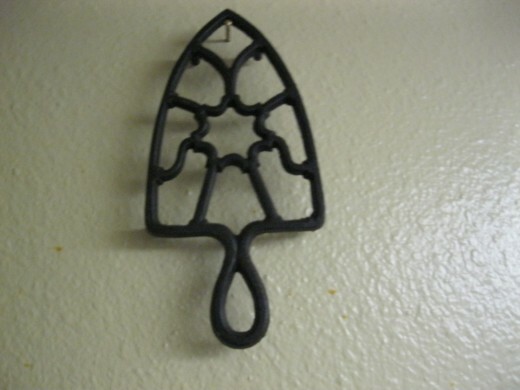 MYWIKISTEP, I love my inherited cast iron and I have started collecting the trivets. 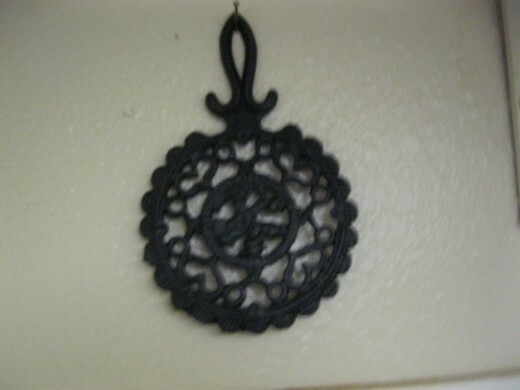 They are so decorative and useful hanging on the kitchen wall. I just grab one when needed. They need care the same as the cookware. I am happy you found this useful and thank you for coming by to visit. This is very useful. I think we all have inherited some cast iron objects. Nice! hlwar, I also inherited a bunch of cast iron, but I had learned how to take care of it while I was growing up. We took it camping and used it on the campfires to help keep it clean. That burned the extra grease off of it. It needs the grease to keep it non-stick but when it gets too much, it takes fire to burn it off. I am glad you can find some of this useful. So very informative, and many thanks for the useful tips! I sort of inherited cast iron skillets from my mother and they're my favorite pans to cook with. But I never knew just exactly how to take care of them. Shelley, I would scrub it with a stiff brush to get most of it off and then stick it on the edge of a bonfire and burn the dirt and rust off of it. Then let it cool in the fire pit, until next day. Tap it gently with a hammer to knock the burnt dirt and rust off of it. Not too hard or you could break it, cast iron is brittle. If the dirt and rust doesn't come off of it, you can use fine steel wool on it and that should take it off. Make sure it is fine steel wool as it will scratch it. That doesn't matter with a trivet as much as with cookware though. 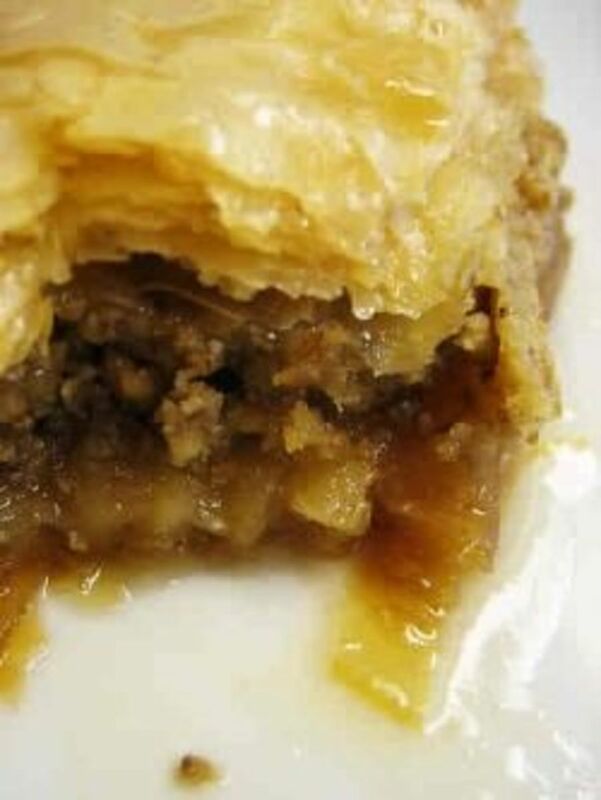 Then use some shortening to grease it and either put it in a gas barbecue for about 20 minutes or on foil in your oven at 350 degrees for the same length of time. That should have it back to normal. We are currently digging sandstone blocks out of an old foundation and in doing so, we found an old trivet. We brought it home thinking it would be nice to clean up and keep. 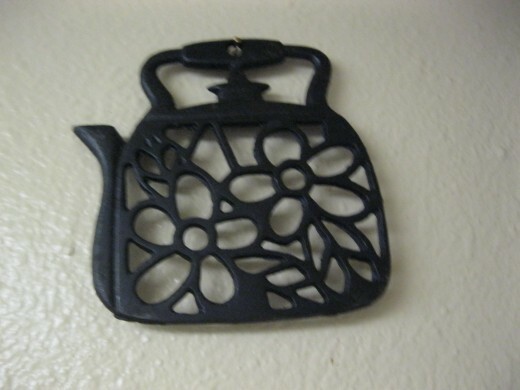 It looks like the photo you have above of the trivet shaped like a teapot, except filthy and covered with rust. Who knows how many years it has been in that foundation. Do you have any tips or recommendations on how we can get it looking its best? Thanks! rebeccamealey, Cast iron is very forgiving. It is extremely hard to mess it up and almost impossible to ruin it. The only thing that cannot be repaired is if you do not wash it and it will pit or if you scrape gouges in it. In both cases food will stick in the scrapes and pits. They can be sanded down, if you wish to spend that much time on them but it takes a good while to do that. Thank you for coming by to visit. prettynutjob, all you have to do to dry them and keep them from rusting, is to not scrub too hard with detergent and make sure they get dried well. Grease cutting dish soap is a no-no. Use a mild soap, if any. Dry them on the burner to make sure all of the water is out of it. Then lightly grease them. They will never rust if you clean them that way. Thank you for the visit and comment. I love my cast iron skillet. It doesn't seem to ever pose a problem. Great hub, voted up and shared, I love cast iron skillets but hate cleaning them. I have rusted so many of them, my hubby told me to let him clean them because I kept ruining them. Docmo, glad I could help you with your cast iron cookware. It truly is wonderful at producing an even, all over heat. It is also wonderful because once you get it cured properly, it is virtually non-stick. I appreciate the comments and visit. wabash annie, Glad you enjoyed the information. I have been using cast iron since I was a child. My parents and grandparents used them and showed me how to take care of them. We have some really old ones. My grandfather used his grandparents cast iron. Thank you for coming to visit. I have been looking of some handy tips to cure our cast iron wok and pan. This is truly useful Becky. I like cooking in cast iron as the way it disperses heat uniformly makes for good cooking times and quality. Thanks very much for this. Enjoyed the information. I have several cast ir0n skillets, a dutch oven, and a pot with legs. All are old. Great hub! bravewarrior, I have used this stuff for my whole life and still did research to find out how others clean it. I wanted to make it complete and offer people all the options I could. I still missed a few and learned about them in the comments. I am going to have to add them in. I appreciate the visit. This is very informative, Becky. Most of my cast iron skillets need to be re-seasoned. I will print this and keep it on hand. When I clean mine, I use nothing but hot water - no soap at all. My mother uses course salt and a paper towel to clean hers if food does happen to stick. 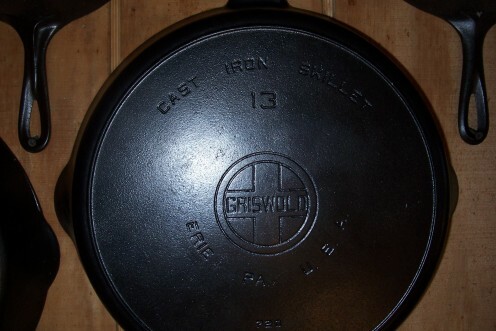 Alise-Evon, I had some people asking me how to take care of cast iron, they had never had any. Those questions spawned this hub. Many have never used it and their parents didn't use it. That left them not knowing all the things that I learned from my parents and grandparents. I am so happy that this helped you with your questions. Thank you for coming to visit. You are right, this answered all my questions about caring for cast iron. Excellent hub. Voted up, useful, and shared. Frank, Thank you for the useful and clever. I couldn't believe how many don't know how to use cast iron. I guess a whole generation has missed out on this great stuff. My parents had a lot of it and used it often. I figured someone would like to learn more about it. Thank you for coming to visit. I was raised using it but damaged my tendons. Dr. told me not to use the bigger ones and the repair should hold a little longer. I really like my big cast iron skillet. I wrote a Hub a while back about making cornbread pancakes, featured that pan in the pics. Bought it at Farm & Fleet when we first moved here as a gift for my wife. She had never used one before, didn't like it at first because it was so heavy. Now it is the only one we use, and our expensive stainless sit in the cupboard. tmbridgeland, I had a big 30 inch one and gave it to my son. I couldn't lift it any more and with my family shrinking as they aged, he had a bigger need for it. Cast iron is the greatest and it is fairly easy to take care of. Over cleaning is as big a crime as not cleaning it in my book. That is like putting the wooden handled knives in the dishwasher. Thanks for coming by to visit. 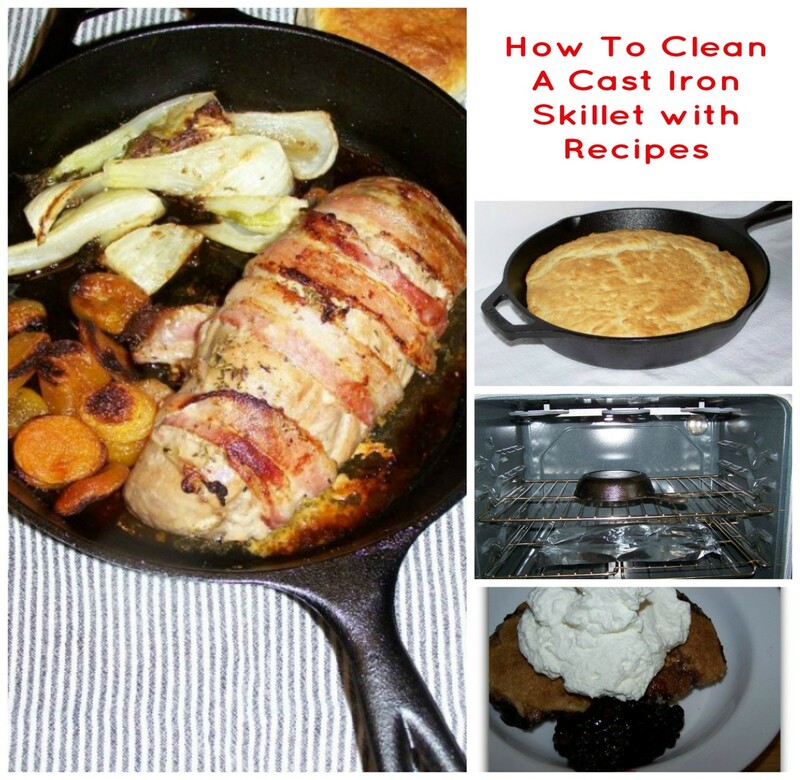 use a big Griswold cast iron pan just like in your top picture. It's great. Only problem I have is keeping the kids from over-cleaning it. My mom would occasionally clean her's in the oven. Just put the oven on the self-cleaning setting and run the cleaning cycle. It burns off any char or burnt on food. You do have to re-season it after. Mama Kim, cast iron is great stuff. I have an old enameled cast iron casserole that was my great aunts. It is white on the inside and yellow on the outside and is so easy to take care of. It looks great hanging on the wall or sitting on the table. I have also used it on top of the stove. I would not get rid of it for the world. I love all of mine and use it as much as I can. I am happy that the explanations helped. People have different takes on whether to wash with soap or not and I leave it up to them to decide which they prefer. I do know how to get a badly filthy one clean though and it is not by chipping cooked on food out. That just damages the finish, making it less non-stick. I also love my dutch ovens. Cook stove, oven, or campfire, it doesn't care. Thanks for coming by to visit. I love my cast iron pan, especially for items that go from stove top to oven... very convenient ^_^ Great hub and especially liked your explanation on cleaning ^_^ voted a bunch! Ghost, at your age, not to know how to take care of cast iron is silly. Your mother's was probably well cured from using it. And as long as it was not allowed to sit with food in it, and was used daily, it would mostly stay cured. I am sure that your mother knew how to take care of it and probably didn't see a reason to teach you how to take care of it. Scrubbing with the older soaps was not as bad for it also. The newer ones have more grease cutting ingredients in them. If you bought a new one and started using it, that is when you would need these steps. Also if you got your old ones out. They probably would need a good scrubbing, greasing and curing. Sitting in a box, no matter how dry, they always get rusty. Thanks for coming to visit. Darcy, Thank you for the compliment. I try to be accurate when I write about a subject. I do additional research even if I know the it well. Thank you for coming by to visit. This is one of the very rare How To's that is spot on and very detailed. Tonipet, I am so glad I could bring back memories of the old days. Those are the best kind. Using your ancestors cast iro is so awesome and I know you cherish it. I am so glad you came by to visit. Hello Becky. The cast iron Dutch oven I have been using has also been handed down to me from my grandmother and seasoning has helped it last until today. Most of our other cast iron pots are used in the dirty kitchen and amazing these were the same pots my great grand folks used. You just brought me back to times of long ago, my favorite! Voted up awesome and interesting, thank you! Hi Peg, I am so glad that you found something to help you with your cast iron. I was raised by people who used cast iron constantly. They knew all the tricks. I needed to share with those whose parents did not use it. I needed to save the info from becoming lost. I can't use it unless I have someone else cooking because I have damaged nerves and can't pick the heavy stuff up. My daughter has never used it. I am going to gift her some when she moves out, with instructions to use it. Hi Becky, This is great information, educational and useful. I wish I had known about the fire pit method of cleaning when I found my cast iron frying pan a dozen years ago. It has taken that long and a lot of elbow grease to scour off the blackened char that covered the exterior of this very old Wagner ware skillet. I love cooking in this pan. When I used the non-stick cookware in a recipe last week it just didn't give the dish the flavor I was used to. Your tips on seasoning a cast-iron pan are thorough, detailed and easy to follow. Thanks for sharing the knowledge! J.S. Matthew, I like to do some research on my hubs and this was so interesting. I love history and this just looked like something that would go well in here. I have had my dad's and grandparents examples to learn from and they knew quite a bit about cast iron. That is all they had when my dad was young. Cooking with acidy food is all right as long as you clean it immediately after using it also. We used to make spaghetti in it and it never damaged it but we cleaned it right away. I would never clean it in a dishwasher but it would need to be oiled frequently if you did. I use a mild soap, never one that is supposed to cut grease when I wash it and then dry it on a burner and lightly oil it. It never gets a chance to rust. The oil soaks right in as it cools. I really appreciate you coming by to visit. I love how you included the historical use of cast iron in this Hub and I also learned from your scientific explanation of how the metal and elements are formed and bonded. I find this is very interesting! Very well researched-you know quite a bit cast iron! I enjoy cooking with my cast iron. I just use a soft brush and hot water to clean but I can understand your concern for cross-contamination. One of the restaurants I worked in actually cleaned them in the industrial dishwasher! They never got rusty because they were frequently used in the broiler and they were very well seasoned. I guess if your pan is seasoned enough that mild soap wouldn't hurt it then it is ok.
Great information here! Voted up and sharing. Hey b. malin, how are you doing? Glad I could educate you a little. It isn't easy finding things that people do not know about cast iron. Thanks for the votes, punny humor, and for coming by to visit. Hi Becky, Wow, look at all the Wonderful Comments, you really "stirred" it up with this Hub on care for Cast Iron items. This was such an Educational read, everything anyone would need to know... and somethings that I didn't know! A very Interesting fact about not using Cast Iron to boil water...it can Rust...who knew. I gotta give you an UP and Useful and Interesting Vote Girlfriend, Thank You for sharing! With cast iron it is easy though. Build a little bonfire and stick it in there. It will burn out and then you can re-season. It will be a little bit until it is non stick but it will not be in the garbage. Becky, I feel your pain! There are few things harder to clean than a darned dutch oven with scorched on food. Beth, I wish my husband knew how. He is the reason I have had to use the burn method to clean my dutch oven a few times. He burnt a ham in it and the crust was an inch thick. I tried to scrub it and ended up just burning it clean. I won't let him cook any more. Thanks for coming by to visit. Becky, helpful Hub. My husband does most of our cooking and thankfully knows how to cure the cast iron and as well cook on it and clean it. He doesn't trust me to touch it, which I find a wonderful relief, lol! Docmo, Glad I could help. If you need some help, just let me know. The stuff is nearly indestructible. This takes care of all cast iron. I use this method to keep my trivets from rusting also. There are also cooking utensils. Thanks for coming by to visit. Great hub Becky, Have been wondering how to cure some cast iron woks and pots - thanks for the timely info... voted up! I let him know, I don't think it was on purpose. yes, but the comment section has been disabled, Becky. Oh, you will not be disappointed Ian. His hubs are just like his notes. Try his stories. They will have you in stitches. Great sense of humour, Thomas. I'm going to have a look at you hubs. You'd better fulfil your promise. Thomas, your sense of humor is really sick at times. I really enjoy it. I was just kidding...you know, trying to add some excitement to the subject at hand. What I really did was to listen on my CB radio to hear Fiire Department chatter. There was an old shed burning down by Walgreens. I rushed down to the fire and threw my old pan into the thick of it....came out real good. Thomas, I hope you are kidding about trying to cure cast iron either way. In the gas barbeque or in the oven are the only ways to go. If you use the barbeque, you get to miss the smoke in the house. I tried to cure an iron pan quickly and used the microwave. It didn't seem to work out. As a matter of fact, I had to buy a new microwave. The second time I tried I took my neighbor's advice and put it on the exhaust manifold of my car engine. I had a hard time getting it to stay on when rounding corners. Next time I will follow your directions. lifelovemystery, how did you go long enough to get married and not know cast iron? Your mom must have been one of those that was going for the non-stick. 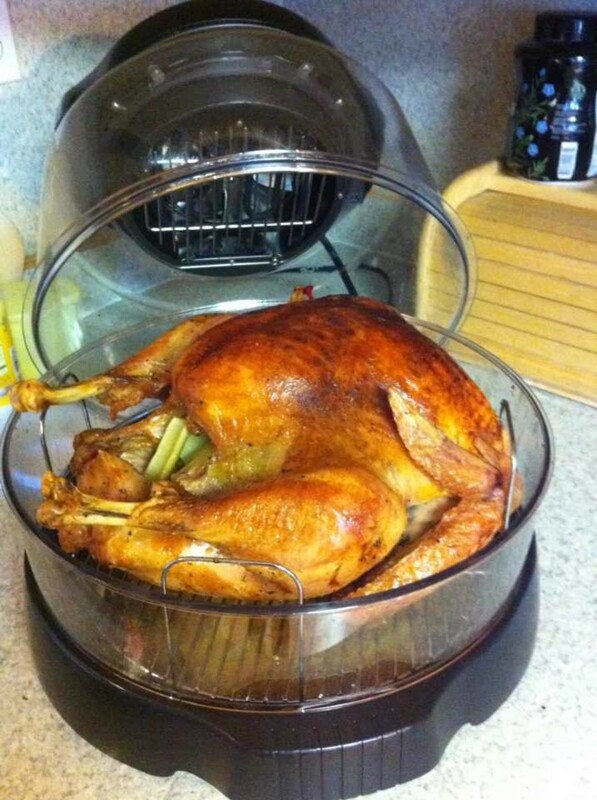 I am glad that you have learned about the joys of its even heat distribution and non-stick qualities. It is so nice to cook on, I know you love it. Thanks for coming by to visit. These are great tips! My husband introduced me to cast iron and I rarely use anything else on my stove. Maybe we do lol, I will have a look. You don't have them there? They are cheese flavored crackers with peanut butter between them, packed in packs of 6. Hey Becky, first time I've heard of these particular crackers, what will they think of next. Small frequent meals seems to be the mode for diabetic diet. Hope Dennis is enjoying his comfort food. Just needed a few things, probably could have done without them. Dennis wanted some soda and some peanut butter/cheese crackers. He needs to have snacks often to keep his diabetes balanced. He eats about 6 times a day, small meals. He is not supposed to get really hungry, that is when the blood sugar really drops and if he eats too much at once, it goes sky high. Awww, poor puppy! Good you got the groceries in before the storm hit. Getting tired of the thunder with my dog holding my feet down shivering. He does not like it at all. Got back from the grocery just 10 minutes before the rain hit. Hi Becky, it's the reporter in me lol. Not bad, how are you? snakeslane, such an interrogation. How are you? Ok, My dear old coot, what is it made out of and what shape is it? I know about woks, it is like them? So glad you came to visit. Hello Mr Lawns, I have to ask, what exactly is a tawa? And while you're at it, could you describe paratha (recipe preferred) and whatever else you could add would be helpful (or you could write a Hub?) Cheers! thumbi7 most probably uses a tawa in the kitchen when she is making paratha. I use one all the time. thumbi7, Do you use cast iron in India? I do not know what type of cookware you use there and am truly interested. It is fascinating the variety of cooking utensils and cookware used in different parts of the world. I am glad you liked this and really appreciate the kudos. Thank you for coming by to visit. Now I am going to have to research India some. You got my curiosity going. Thank you for educating me on how to take care of cast iron utensils. I love the lay out of the hub and the pictures! Dr. Jez, so nice to see you here. I am so happy that you came by and found this interesting. Thank you for coming by to visit. Interesting Hub Becky. I enjoyed the read! Oh now, what makes you think I am that way? I would not do that. I just prefer to use a mild soapy solution to kill germs. Some people, it does not matter to. I am perfectly sweet, and I will continue to do it my way. Becky, my friend,I can almost see you with your arms folded across your chest as you say, "Most of us have our own little tricks for taking care of our cast iron. Thank you for sharing yours. I am glad that you found this useful". (And then saying to yourself, "But I know what I know, and I'll continue to do things MY way", with a beaming - but obviously false smile on your face). vespawoolf, Most of us have our own little tricks for taking care of our cast iron. Thank you for sharing yours. I am glad that you found this useful. I appreciate you coming by to visit. I love my cast iron skillet and use it for everything from scrambled eggs to searing steaks. I wash my cast iron with water then put it on the burner for a few minutes before oiling and putting away. As long as I don't use soap the seasoning stays put, making it a safe non-stick cookware option. Thank you for this informative and interesting hub! Eddy, I am so glad that you will get some use in this. It is not hard or labor intensive to take care of cast iron. It just takes remembering to do it. It will also outlast us and cooks so evenly that it is worth the little extra effort to have it. It is such a joy to cook on. Thank you for the votes and the visit. This one Is so useful for me as I have a cast iron griddle (plank) on which I bake Welsh Cakes. So a vote up up and away plus bookmark here. mar, so glad you found it useful and interesting. It is not easy to make educational materials interesting as you know. I am glad you liked the trivets. They add so much warmth to the kitchen. You would not think that iron could do that but it has such a mellow glow and they are quite interesting to look at. Some of them are very detailed. I really appreciate you coming by to visit. Luxmi, yes, the curing, keeping it oiled, and not scrubbing the grease out of the pores of it are the key to keeping it from rusting. It is like your car motor. Keep it greased at all times. Ian, I will tell her you read it. She is walking the dog right now. As an Instructor, I must commend you in your approach to this subject. This is thorough, meaningful and most interesting. The pictures of your trivets are absolutely beautiful. Outstanding piece! Voted UP & UABI-- textbook material. Hugs, mar. Thanks for this informative Hub. I have always loved the idea of cooking with Cast Iron, but disliked the fact that it so often rusted. Now I know why! I needed this Hub, because quite obviously, I was totally clueless! This Hub gives me powerful information on how to season it. An important missing link, I'd say. Becky, tell Katy that I will go and search for it right now. If you don't watch a lot of movies, perhaps miss this one, but I loved it.... it was unlike any movie I have ever seen. Quite haunting in a strangely disturbing way. Ian, dear friend and beloved old coot. You should have bought the cast iron. It is almost unruinable. My stepson ruined many of my non-stick pans before he learned to cook. He thought that everything should be cooked on high so he could eat faster. I will see if I can find it but I do not watch many movies but I will for you. I am so happy that you liked this. Katy was wondering if you had seen her latest hub? She is rather proud of it, with rights. I really appreciate you coming by to read this. Love ya, my old coot. Becky, what a coincidence. 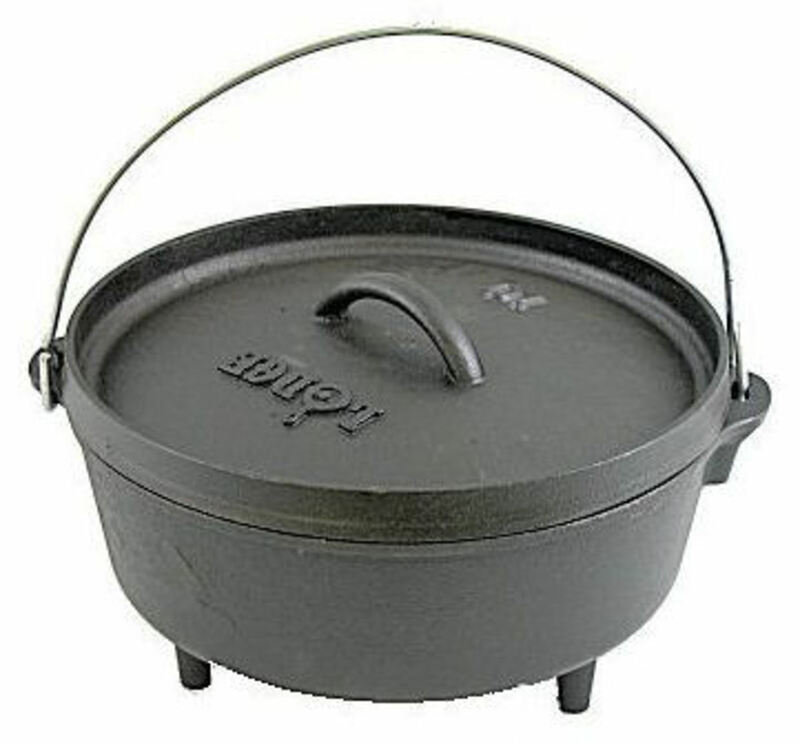 I was at IKEA today, and was wondering whether I would buy a cast iron pot. It just came into my head, and left almost as quickly. I am no cook, and it would most probably be wasted on me, but there you go. i bought a non-stick frying pan instead because the person who does most of the cooking for me has somewhat wrecked the last one. If you can find it, there was a movie made some years ago: 'Liebestraum' which deals with a building which is of beautiful cast-iron construction, so main character wants to study it before the demolition. There's a bit of intrigue and a very old murder and over the next four days, their attraction grows one character explores the old building, attends his mother's (a very old Kim Novak) bedside, and unravels the past. I loved it. Very evocative movie. I loved your hub... I'm amazed at how intriguing it was to read, Well written. I'm sending you a picture of a piece of cast iron which I am sure you will find very beautiful. Dusty, You have a collection that would make a collector cry already. You might want to go through ebay sometime to get an idea of how much yours is worth. I really can't figure out much without good pictures anyway. Label marks and all. I would love to help you price it just so you would have an idea. There are some really good books out there but the only way to find out for sure is to have them researched. Love caste iron. Good reminder to re-season the one my husband just has to scour. Do you want a price on them Dusty? I was just trying to identify them. After they are identified, we can worry about pricing them although they will be rather high. That amount each would be my guess.